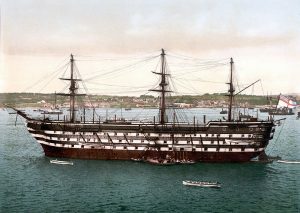 On the eighth of October 1878, with my mother’s consent and blessing, I kissed her goodbye and set out for Devonport to join the Royal Navy. I had come to this decision myself and made up my mind; there was to be no turning back. My aged grandfather, with whom I was a favourite, and my sainted uncle, Walter Libby, for whom I had the greatest admiration and affection, each foreboding anything but a prosperous career for me, concluding that I was too self-willed for a disciplined service. On arrival at Devonport I had five shillings, enough to pay my fare back in case my heart should fail. It is an important moment in my life; I must sign to serve for ten years from the age of eighteen. Making my way to Mutton Cove, there came into view the two old line of battle ships, the Royal Adelaide depot ship for men and the Impregnable training ship for boys. Here, I must confess, that I hesitated before taking the decisive step. At last I got into a waterman’s boat and he rowed me off to the Impregnable for sixpence. On ascending the accommodation ladder, I was met by one of the ship’s police, who enquired my business. My reply: “Come on board to join the Navy”. “Have you any papers?” I produced the papers furnished me by the coast guard officer. He took the papers and then left me standing for a long time. This being the dinner hour the boys were at liberty running about as they pleased. First one came and spoke to me then another, many of them advising me not to join and enumerating the disagreeable things that awaited me if I did. In the first few days the new entries were not kept on board the Impregnable but were accommodated on board an old frigate until such time as they were fitted out with clothes etc. After a further long wait, it being now 3.30pm, I was hustled down the ladder into a boat and taken on board the old frigate Circe. There I was further questioned, then conducted to the bathroom and ordered to take a bath. Eventually I was given a hammock and claws for hanging it up, the claws first to be attached to the hammock. A friendly boy came to my help, showing me to the best of his knowledge how this was done. A bed and blanket was also handed to me. Thus I am set up for the night’s repose. It is now tea time and with about thirty other new entry boys I am handed a joint of bread and a basin of tea. The evening was passed with the usual boyish frolics until nine o’clock when everyone had to be in his hammock. The following morning all hands were roused from their slumbers at 5.45am, the boys mustered and decks scrubbed. At 7.50am, breakfast, a basin of cocoa and a joint of bread, rather a new experience for me as a new boy. There was very little to occupy our time other than cleaning already clean brass work and sweeping already clean decks. I remember hearing one boy – I think he had been a farm boy in Devon – accustomed to real work, say when ordered to sweep the deck “I’ve bin over’m three times already”. After a week or so and now being fitted out with a complete kit, with a number of others I am sent on board the old three deck line of battle ship Impregnable – at one time mounting one hundred and twenty muzzle loading track guns – now a training ship for boys – to commence my training as a naval seaman. The day commenced at 5.45am by the sound of the boatswain’s mate’s whistle and the deep bass voice calling along the decks “all hands, rouse out, rouse out, rouse out, lash up and stow, lash up and stow, lash up and stow” (hammocks), sometimes varied by “show a leg, show a leg, show a leg”. The police were soon on the move, canes in hand, and woe betide the lad slack in slipping over the side of his hammock. My billet was in number nineteen mess on the lower deck, containing about twenty-six boys and at food time the stronger ones got the lion’s share. A slippery little pock-marked fellow came to my help for the first few days and saw that I did not go short. The bully of the mess, known as Napoleon, kept the smaller boys on the run. Being well-grown and developed, he thought that he had better let me alone, contenting himself with an odd threat now and then. One day Napoleon fell afoul of a boy named Sullivan and, the police being absent, he got a thorough good hammering. About twelve months after, Sullivan struck a petty officer – a man not much beloved by the boys – a serious offence for which he was punished and discharged from the service. Realising the importance of the step I had taken in entering the Royal Navy as a second class boy, with a starting wage of sixpence per day, I decided to do my best to make my career a success, to follow it up and take the rough with the smooth. The change from my village home and the separation from my pals, with the constant hustle at every order passed along the decks by the boatswain’s mates, did not at first tend to make me very cheerful. On the contrary I was rather homesick, but there was no turning back, the situation had to be faced with a brave heart and cheerful spirit. Amongst the eight hundred boys on board there were many recruited from the labouring classes of our great cities, with nothing to learn in trickery and mischief. My determination was that this element should have no influence over me, that I would go my own way and steer my own course. Having determined on my life’s work, I was impressed with the necessity of taking as my guide the teaching of the New Testament, and not to cast on one side the Puritan teaching in which I had been cradled, with the conviction that this would be a safe course and probably save me from many pitfalls. On looking back I have no doubt that this decision was in no small measure a factor in my successful career. In passing through the various classes of instruction I found that I could hold my own with the majority of the boys. My knowledge of boating, swimming, etc. stood me in good stead. At the instruction in knots and splices I got on so well that Tim Daly, the instructor, a good hearted kindly Irishman, one day remarked that with such progress I would soon be a boatswain (warrant officer). Many years after I met Tim, then a labourer in the dockyard, who was pleased to see me an officer, and to know that his instruction had not been in vain. The first two months soon passed away and with others I boarded the train bound for home on Xmas leave. My father, now at home, and my mother were proud to have me back again, if only for a brief period; my father approving of the step I had taken during his absence. My companions put to me a hundred questions, how I liked it, what food did we get, could I put up with the discipline etc. etc. On the expiration of my leave, and returning on board the Impregnable, I gave my best attention to my instruction and very soon passed from one class to another. The compass instruction with its cardinal and half-cardinal, false points, by points, half points and quarter points, proved a difficult subject to the majority. Seeing that my father, at an early age, had taught me to ‘lose the compass’ or to repeat the thirty two points, in this class I had the advantage of those that had never seen a compass. 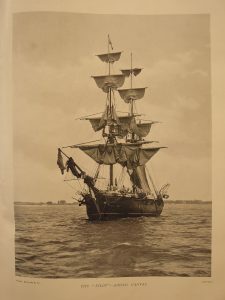 Every boy was allotted to a part of the ship, such as forecastle boys working in the fore part of the ship, fore top, main top, mizzen top and quarter deck boys. My station was among the forecastle boys. After I had been there a few months, the petty officer would sometimes call me out to the front and with him look after the scrubbing of the decks etc., giving me a sort of leading boy’s position. In due course I was promoted to a petty officer boy and granted a good conduct badge. Being a petty officer boy gave me authority to order the forecastle boys, when scrubbing decks or other work on the upper deck, and helping the petty officer in charge of the forecastle. There were privileges too such as a special afternoon leave now and then. The boatswain of the ship, a bluff sea-dog very well-liked by the boys, named Jones, always had the names of a few of his favourite boys ready on his tongue, to whom he would call if he wanted anything special done. That would mean his handy boys would be kept at it, clearing up odd jobs after the others had been dispersed; unfortunately after a time my name was added to his list. In the month of April with about one hundred others, I joined the training brig Pilot, quite a new ship commissioned for the first time, for training the boys in seamanship with cruises in the channel. This, to most of the boys, was quite a new experience; the motion of the ship lifting and falling to the ocean swell very soon prostrated the most of them with sea sickness. Having found my sea legs; and gone through the stage of seasickness in my previous short experience afloat, gave me a sort of superior feeling. The usual time allowed to the boys in the training brig was six weeks. In June, our training brig course completed, all the boys returned to the Impregnable. Being now fully trained, we were considered fit and ready for discharge to a seagoing ship. On the subject of punishment meted out to defaulters, it usually took the form of caning or birching on the buttocks. On most days at noon there were usually a few boys for punishment for such offences as chewing tobacco, skulking, slovenly in dress, slackness at the sound of the bugle, etc., one and a hundred offences that called for six to twelve cuts with a heavy cane. The more serious offences, twelve to twenty four cuts with the birch. Several birch rods bound together at one end to form the handle or grip, the other end of the rods being loose. By the time a boy had received twenty four cuts on the bare buttocks, laid on by a ship’s police with his heaviest swing, his flesh was like a piece of liver, black and blue. It was a relic of the cruel days of flogging with the cat. There were two out of the six ship’s corporals, or police, who took a fiendish delight in lacerating the flesh of those unfortunate lads whom they were called on to punish. The punishment was frequently out of all proportion to the offence; often just a boyish prank magnified by one of the police into a crime, against which the offender was quite unable to defend himself. There was one boy in my mess, a mischievous, simple sort of fellow, but without guile. The police got on his track, his first offences brought forth a caning, then twenty four cuts with the birch followed within a few days by another eighteen cuts. It struck me at the time as being cruel beyond words. All punishment was carried out in the presence of the whole assembly, the ship’s surgeon being present to witness the same.